Instead of seeing the status single as a disease rather, the goal ought to be to enjoy your singlehood and make the most of it. You may never be single again, or perhaps not for a very long time. This is your opportunity to focus completely on yourself. Not just on your self-development, but on doing the things you love. Be happy to have been given this special opportunity to get to know yourself. Look at it this way — if you are uncomfortable spending time alone with yourself, what makes you think anyone else will feel comfortable spending time with you? This can be quite a challenge to someone that has continuously filled up their lives with someone else only to discover that they really don’t know or like themselves at all. Having a relationship with yourself is exactly like having a relationship with someone else. You have to be supportive, caring, understanding, and yes, you have to learn to listen and communicate with yourself and your inner guidance. Sometimes the only way to get you to listen to yourself is to force this “time alone” upon you. Relationships come and go, but friends and family are often around for much, much longer. Your singleness is an opportunity to spend quality time with those in your life that matter the most to you. You don’t want to look back and regret not having spent enough time with someone when you had the chance. Without a significant other, you don’t need to run things by another person before you jump in. Suppose you want to get a pet: no one is stopping you! (Except maybe your landlord, depending on your lease…) The point is, you can make snap decisions and enjoy them, because there’s no one there to consult. The only feelings that matter are your own! In a society where being single is frowned at, you are bound to come across people who wonder why you’re single, They might even imply that something is “wrong” with you if you’re single. Brace yourself for that kind of ignorance. Remember that you don’t have to defend your right for being single, just like it’s rude to attack the validity of someone’s relationship. Just say “I prefer being single” and change the subject. Reading is one of the best ways to entertain and educate yourself at the same time. We all give the same excuse: I wish I had the time to read more. Well, without a special someone in your life chewing up time, spend it instead with a good book. Better yet, some of the best relationships are the ones that you will forge with fictional characters. A perfect time to go back into college, do an online or a part time course, you might even want to at some point change your career. Figure out what you are passionate about and go for it. There is no one to hold you back but yourself. Not sure what you are passionate about? Like I mentioned earlier spend more time alone. It will come to you. Give yourself a chance to listen to your inner voice. This process can take time and you really have to be patient with yourself. Not necessarily for romantic reasons, just to expand your support community. If you are consciously attempting to stay out of relationships for a designated time period, you will still need people to share your life with. Friendships are paramount. Where would we be without our friends? Truly alone. No friends? Are you friendly? Do you make an effort to say hello and meet new people? Perhaps you need some help with overcoming shyness. It is always us that separates ourselves from others. Take responsibility for who you are or are not attracting into your life and make the necessary changes to attract some solid friends. What a great way to get to know yourself again. Start with reconnecting with your body. It’s the only one you have this lifetime and we often look after our cars (which we can trade in) better than our bodies. Singlehood is the perfect time to get yourself in shape and the endorphins released when you work out keep your spirits flying high. Why not pick up an old team sport you used to play in school? Go to the gym, jog, cycle… Adopt a healthy eating habit… it’s a great way to stay in shape. Each night before you go to sleep, concentrate on what you are grateful for in your life. Every tiny little thing can help create the spirit of gratitude. If you are so inclined start to write a journal about everything you are grateful for and watch the list get bigger and bigger each day as your gratitude attracts more things to be grateful for. This is probably the most important lesson of all, finding happiness in contentment in what already exists in your life. The fact that you have one is a really good place to start! (12) Step out of your comfort zone. Each week plan to go somewhere new, travel to a new country or do something different. Don’t wait until Mister or Miss Right is in your life to follow your dreams. Do it now. You have more chance of meeting your special someone if you are living your life to the fullest. Even if you don’t want to meet anyone you still will have a blast following your hearts desires. Reflect on what you’ve learned from past relationships so future relationships get a better start. Don’t look for love until you have an open heart that is healed from past hurts. Being single is a “lifestyle choice” and not a “default option.” It is possible to CHOOSE to be single. There are advantages and disadvantages to being single just as there are disadvantages and advantages to being married… All part of the fabric of life no status is “perfect” Whether one is married or single is nothing more than a lifestyle choice. When we see single as a “disease”, we become needy. The greatest counterpart to someone needy is a partner who doesn’t need us. ( the unavailable) This becomes a game of cat and mouse with the cat always chasing — but never catching — the mouse. People who are needy are suffocating to be around. The problem is, needy people give control of their happiness away by making their own happiness dependent upon being loved by someone who they may or may not have a chance with. If your partner doesn’t take the time to nurture you or the other relationships in their life, there is no way you are going to be “the one” to change them. This is about emotional maturity. The emotionally unavailable are not mature enough to sustain any more than a cat and mouse game. If you stay with someone like this, you will feel more alone than if you were single, but your fears of being alone keep you from seeing rejection as more painful than aloneness. If you can’t be happy being by yourself and accepting the fact you are single, you will never be happy in a relationship. Why? You are making your happiness dependent upon something happening that you have no control over. Only you can make you happy. At the end of the day, the events and circumstances of your life only have the meanings that you give them. Those who are less secure about their own value as romantic partners tend to be more willing to compromise their standards in a relationship like partner traits, such as intellect, attractiveness, social status, and interpersonal skills. In a nutshell those with stronger fear of being single will be willing to accept lower quality mates in order to avoid being single. The fear of being alone can trap you into accepting treatment that is far below the standard of what you deserve and also keep you trapped in unhealthy relationships. If you find that you are constantly justifying and rationalizing your partner’s treatment by saying to yourself or to others that “nobody’s perfect,” or “it’s not that bad,” then you are running from your own insecurity into a relationship that will only create more insecurity for you. Further, justifying and staying in these dead-end relationships only keeps you from finding the right person for you. The fear of being alone makes us cling on to our ex’s even when we are in a relationship; we always try and keep a door open just in case we end up single again. You never take time to heal after a breakup… according to experts it takes almost a year or more to heal depending on the circumstances or emotional condition of the persons involved.. If you can say “I am OK without a relationship,” then you’re ready for one! You’re OK being single—not in a resigned or defeated way. It’s more about one having a deep knowing of who you are, your purpose and that while you desire love, you won’t allow yourself to be miserable while you’re single. Next week I will discuss ways to enjoy and embrace singlehood. 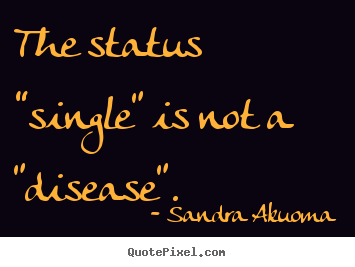 The status “single” is not a ”disease”. The idea that true happiness can be found only with someone else is a myth. Wherever you go in life, there are some aims and desires we are all expected to share: get a job, advance our careers, meet our perfect partner, have a family, own our own home, have grandchildren and so on. Wherever you go, you see allusions to this progression, but it is largely a myth perpetuated by culture, culture masked as religion, marketing and the media. When did being single become such a disease? What are the opportunities of being single? You only have to consult yourself about working late, going to the gym, getting together with friends, or visiting that art exhibit that caught your eye. If you decide to throw a last minute get-together with friends, you don’t have to worry about inconveniencing your partner or encroaching on his/her space. Don’t underestimate the value of this flexibility. Did you ever consider the blessings inherent in being able to do things at your own pace? You can let the laundry pile up as long as you wish – or never let it pile up (no one will be working against you on this one), eat “eba” for breakfast or cereal for dinner. You can paint, wallpaper, decorate and arrange your living space exactly the way you want it. If you decide to change it next week, you can do so without consulting anyone. You can play your favourite tunes at home, be they classical, jazz, rock and roll, blues, hip-hop, Afro beats or hard rock. It is your space – you make the rules as you go along. Embracing a second family isn’t always the easiest proposition and generally requires tremendous patience and understanding. Our culture does not help as well… the in-laws normally dictate the tone of the marriage, they interfere a lot … It is great that at least for now, this is a non-issue. It can be difficult enough to iron out problems with your own family, talk less someone else’s! Do you have special holiday rituals that you look forward to each year? As a single person you can continue to enjoy them, at each and every holiday. Is it your dream to travel round the world, engage in a lot of adventurous trips… This might not be everyone’s cup of tea, but you are free to plan the trip for whenever, stay where you like, sun bathe, or shop till you drop. The possibilities are endless, and the choice is yours and yours alone. You are not constantly arguing and thinking whether the person called or text you back, you save so much money as you do not need to buy gifts to impress your partner. You can mix up easily with people have more male or female friends with no fear of someone getting jealous and throwing tantrums or the feeling that you are cheating on your partner. Here you get to network better and even build lasting relationships. 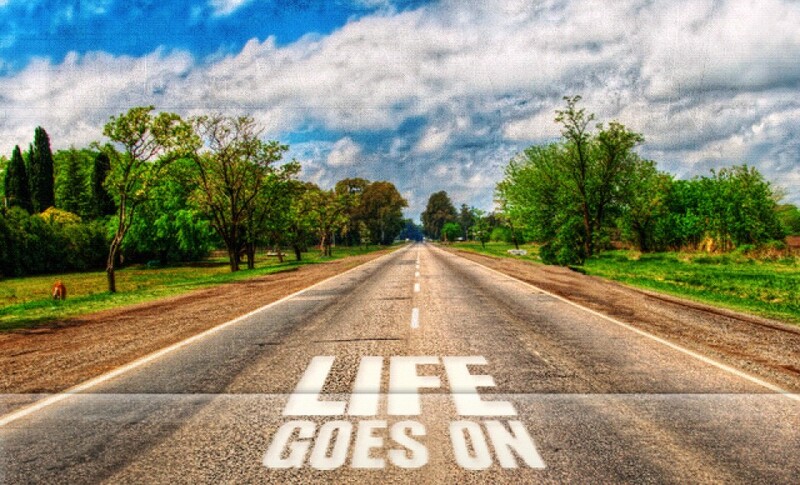 Life is about what makes you happy, not what would make your parents, friends and the general public pleased. Being content is in no way defined; each person must find his or her own happiness, which will not always align with the world’s expectations. Being single can be so much fun, you don’t have to get depressed about it. You must learn to love yourself first of all. Know this, relationship doesn’t define you. Single is not a status, it is a word that describes a person who is strong enough to live life without having to depend on someone else. In as much as you want to feel loved and wanted, do not rush into a relationship because you are bored or lonely but because you want to.